Kelly Nelson has compiled an 18-1 with a sub .60 earned run average for the Norton High girls’ softball team. 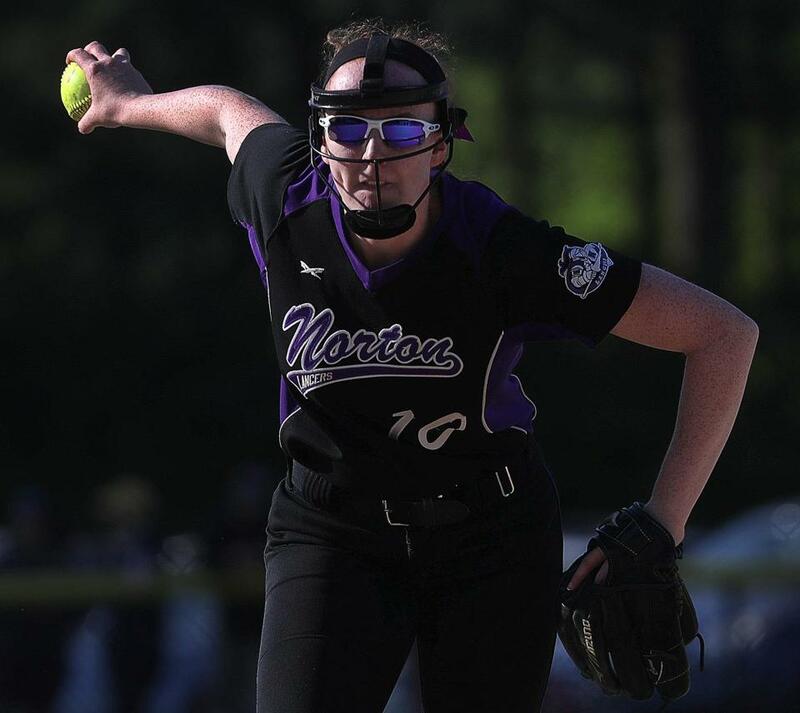 For the second consecutive year, Norton High senior Kelly Nelson is the Gatorade Massachusetts Girls’ Softball Player of the Year. During the regular season, the 5-foot-11-inch righthander led Norton (19-1) with a sub .60 earned run average with 266 strikeouts over 122 innings. She currently holds the state record with 1,245 career strikeouts, with 18 no-hitters and 10 perfect games. Last spring, Nelson posted a 0.11 ERA and hit .406 at the plate with 22 RBIs in becoming the first Norton softball player to be named Gatorade Player of the Year as the Lancers won the Division 2 South title. Norton will be a top seed in the Division 2 South bracket when the MIAA tournament pairings are released on Tuesday. The tournament will being on Thursday. The award recognizes students for both athletic and academic excellence. Nelson is the vice president of her class and a member of the Student Council at Norton High. She volunteers locally as a math tutor and mentor to elementary school students through her school’s PALS program and is maintaining a weighted 4.43 GPA in the classroom. Nelson has verbally committed to play softball at the College of Holy Cross beginning next year. As a Gatorade Player of the Year, Nelson will be able to donate $1,000 to a national or local youth sports organization of her choosing and will have the opportunity to enter for a $10,000 spotlight grant by writing an essay explaining why their selected organziation deserves additional support.